Janggi (including romanizations changgi and jangki), sometimes called Korean chess, is a strategy board game popular in Korea. The game derived from xiangqi (Chinese chess) and is very similar to it, including the starting position of the pieces, and the 9x10 gameboard, but without the xiangqi "river" dividing the board horizontally at the middle. In 2009, the first world janggi tournament was held in Harbin, People's Republic of China. 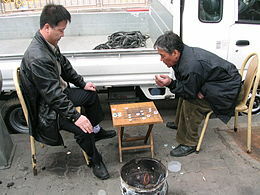 In Korea one will often see older men crowding around a single janggi board while two men play for small amounts of money. These games are played year round, especially in city parks in Seoul. Janggi is occasionally played as a gambling game, and it is currently less popular in Korea than the strategy game Baduk (Go). The Korea Janggi Association is responsible for promoting janggi in South Korea. The board is composed of 90 intersections of 9 vertical files and 10 horizontal rows. The board has nearly the same layout as that used in xiangqi, except the janggi board has no "river" in the central row. The pieces consist of disks marked with identifying characters and are placed on the line intersections (as in xiangqi and Go). Janggi pieces are traditionally octagonal in shape, and differ in size according to their rank. The sides are Blue (or Green), who moves first, versus Red. Each side has a palace that is 3 lines by 3 lines (i.e. 9 positions) in the center of their side of the board against the back edge. The palace contains four diagonal lines extending outwards from the center, forming an "X" shape. The pieces are labeled with hanja (Chinese characters). The labels on the blue pieces are all written in the semi-cursive script. For instance, the blue chariot or cha has a cursive version of 車, which looks something like 车 (the Simplified Chinese equivalent of the traditional character). The pieces that are equivalent to the kings in Western chess are actually referred to as military generals (janggun) in Korean. They are labelled with the Chinese character Han (in Chinese pinyin: Hàn; 漢) on the red side, and Cho (Chǔ; 楚) on the blue side. They represent the rival states of Han and Chu that fought for power in the post-Qin Dynasty interregnum period in China (see Chu-Han contention). In North Korea, the Chu-Han setup is not used; the red general there is called jang (chang; 將, "general") and the blue general is called gwan (kwan; 官, "minister"). Both kings can also be referred to generally as (gung; 宮, "king"). Janggi differs from its Chinese counterpart in that the janggi general starts the game from the central intersection of the palace, rather than from the center intersection of the back edge. The general may move one step per turn along marked board lines to any of the nine points within the palace. There are four diagonal lines in the palace connecting the center position to the corners. When the general is checkmated the game is lost. The general cannot leave the palace under any circumstances. 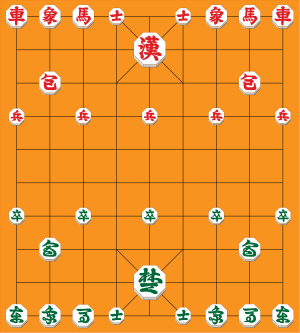 If the generals come to face each other across the board, and the player to move does not move away, this is bikjang - a draw. This rule is different from that of xiangqi where it is illegal for the generals to face. If there is no move for the general to make without getting into check or checkmate, but it is safe for it to stand still, the person may pass their turn - i.e. leave the general in position, and make no move. The pieces are labeled sa (士) and are civilian government officials (i.e. council members serving the commander in chief). They are often called guards, since they stay close to the general. Other names are assistants or mandarins. The guards start to the left and right of the general on the first rank. They move the same as the general, one step per turn along marked lines in the palace. The guards are one of the weakest pieces because they may not leave the palace. They are valuable for protecting the general. The elephants (sang; 象) are located to the left and the right of the guards. They move one point orthogonally followed by two points diagonally away from their initial position, ending on the opposite corner of a 2x3 rectangle. Like the horse, the elephant is blocked form moving by any intervening pieces. Unlike xiangqi, which confines its elephants to one side of the board behind a "river", in janggi there is no river and the movement of its elephants are not limited to one side of the board. The janggi elephant can therefore be used more offensively than the xiangqi elephant. An elephant can be transposed with an adjacent horse in the initial setup. Called the horse or ma (馬), this piece moves and captures exactly like the horse in xiangqi (i.e. one step orthogonally then one step diagonally outward, with no jumping). A horse can be transposed with an adjacent elephant in the initial setup. These are labelled cha (車). Like the rook in Western chess, the chariot moves and captures in a straight line either horizontally or vertically. The two chariots begin the game in the corners. The chariot may move along the diagonal lines inside either "palace", but only in a straight line. The chariot is the most powerful piece in the game. These are labelled po (包). Each player has two cannons. The cannons are placed on the row behind the soldiers, directly in front of the horses (if the horses are put on the file next to the chariots). The cannon moves by jumping another piece horizontally or vertically. The jump can be performed over any distance provided that there is exactly one piece anywhere between the original position and the target. In order to capture a piece, there must be exactly one piece (friendly or otherwise) between the cannon and the piece to be captured. The cannon then moves to that point and captures the piece. They may also move or capture diagonally along the diagonal lines in either "palace", provided there is an intervening piece in the centre (i.e. it can only happen if the cannon is at a corner of the "palace") They are powerful at the beginning of the game when "hurdles" are plentiful, but lose value rapidly with attrition. The other piece over which the cannon jumps may not be another cannon. In addition, a cannon may not make the first move for either player. A cannon may also not capture another cannon. Unlike xiangqi, janggi requires cannons to jump in order to move, as well as capture. These are labelled byeong (兵) (soldiers, general term for a soldier) for Red and jol (卒) (also means soldiers, usually lowest ranking soldiers) for Blue. Each side has five soldiers, initially placed on alternating points, one row back from the edge of where the river would be in xiangqi. Unlike pawns in Western chess, they move and capture one point either straight forward or sideways. (Unlike xiangqi, where soldiers must be promoted to move sideways.) There is no promotion; once they reach the end of the board they may only move sideways. Soldiers may also move one point diagonally forward when within the enemy "palace". After the pieces are set up, Cho moves first. Victory is obtained by checkmating the opposing general. In Western chess, stalemate is achieved when no legal moves are possible. However, the stalemate is not a draw in janggi. The player must skip the turn when all the moves are impossible. If neither player can move legally, or if neither player can win because neither player has enough pieces, the game ends in a draw. A player may decide to make a move so that his or her general faces the other player's general unobstructed (which is called bikjang). In this situation, the second player can either call a draw, or make a move that breaks the position with two generals facing unobstructed. In many cases, the bikjang rule can be used to force the opposing player to call a draw on a losing game, by forcing the other player to sacrifice a valuable piece for breaking the bikjang position. It may not apply in some games, and more often than not the players will consent upon the validity of the rule before the game begins. Check is announced by declaring janggun (將軍), meaning "general". Getting out of janggun is called meonggun, and one may declare meonggun while escaping from janggun. But it is not necessary to say janggun out loud. In Korean tournaments, according to rules set by the Korean Janggi Association, there is no draw in any form, including draw by perpetual check or repetition of position. If a position repeats three times, a referee is called to determine who is at fault. Usually the referee orders the player who is losing to make a different move, so the player who is winning can press for an advantage. Sometimes it is not technically clear who is to blame, and different referees may differ as to which player must deviate, or whether repetition is mutually forced. This rule is applied because a winner and a loser must be decided during the game. If both players have less than 30 piece points, however, a draw is allowed by both repetition and perpetual check. In tournaments where draws are not allowed, draws are resolved by adding up the points of their pieces that are still on the board. Because the player with the blue pieces (cho) starts, they have an advantage. To compensate for this, Red receives 1.5 points (called 'deom (덤)' in Korean), the half-point being to avoid ties. So when the game starts, Blue has 72 points and Red has 73.5 points. If neither side can force a win, the player with the most points is declared the winner.